The chemistry and computer science double major is one of 260 students from across the country, and one of only four computer science majors, chosen for the premier undergraduate science scholarship of its kind. Geoffrey Martin-Noble â€˜16, a chemistry and computer science double major with a concentration in scientific computing, has been awarded a Goldwater Scholarship. The program, which honors Senator Barry M. Goldwater and is the premier undergraduate science scholarship of its kind, was designed to encourage outstanding students to pursue careers in the natural sciences, engineering, and mathematics. Martin-Noble, who serves on the KINSC Student Advisory Board and works to expose kids to computer programming as part of Puentes Hacia el Futuro's Dragon Coders program, is one of this year's 260 Goldwater Scholars, who were chosen on the basis of their academic merit from a field of 1,206 students nominated by faculties of colleges and universities across the country. (He is one of only four computer science majors in this year's cohort.) Goldwater Scholarships cover the cost of tuition, fees, books, and room and board up to a maximum of $7,500 a year. And he's continued that problem-solving since arriving at Haverford. In 2013 he won the Brian Kovaric '05 Memorial Fellowship, which funded his work in Assistant Professor of Chemistry Joshua Schrier's lab. It was there that he became passionate about Schrier's theoretical and computational approach to chemistry. Martin-Noble has continued to work in on projects with Schrier ever since, and in January, he was the lead author on a paper submitted to The Journal of Chemical Theory and Computation alongside three other students and his mentor. 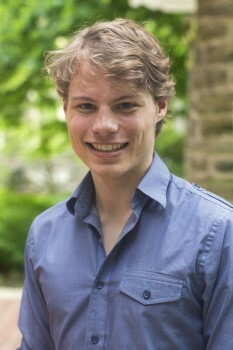 Martin-Noble, who is spending his summer doing research at the University of Maryland at College Park through the Combinatorial Algorithms Applied Research REU program, will return to Haverford in the fall for his senior year. He plans to work on the Dark Reactions Project as an interdisciplinary senior thesis with Schrier and Assistant Professor of Computer Science Sorelle Friedler, and eventually pursue a Ph.D. in computer science.